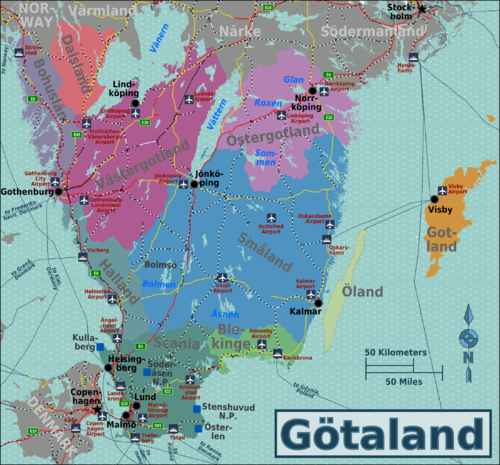 Götaland, latinized form Gothia, is a region of Sweden encompassing the ten southern provinces, between Kattegatt in the west and the Baltic Sea in the east. In ancient times, Götaland was the home of the Geats, götar, who, according to some, they were ancestors of the Goths, who brought down the Roman Empire. They united with the Suiones, svear, to form Sweden around AD 1000. The outer provinces, Bohuslän, Halland, Skåne and Blekinge, were annexed from Denmark during the height of the Swedish Empire in the 17th century. Today, each province has its distinguished cultural identity. Småland, southern Västergötland, and western Östergötland, are recognized as a core of Protestant ethic, with several evangelical churches, a strong temperance movement, and penny-wise entrepreneurship, with the first IKEA store in Älmhult, and the glass shops of Småland, as prominent examples. Climate in Götaland is slighty wetter and milder than the rest of Sweden, allowing mixed forests with diverse wildlife. This page was last edited on 15 June 2015, at 00:05.